Befitting for a building that houses the department of Microbiology and Molecular Genetics at Michigan State University, the floors are named to reflect the fact that there are many levels in between the DNA and the organism's physical appearance. 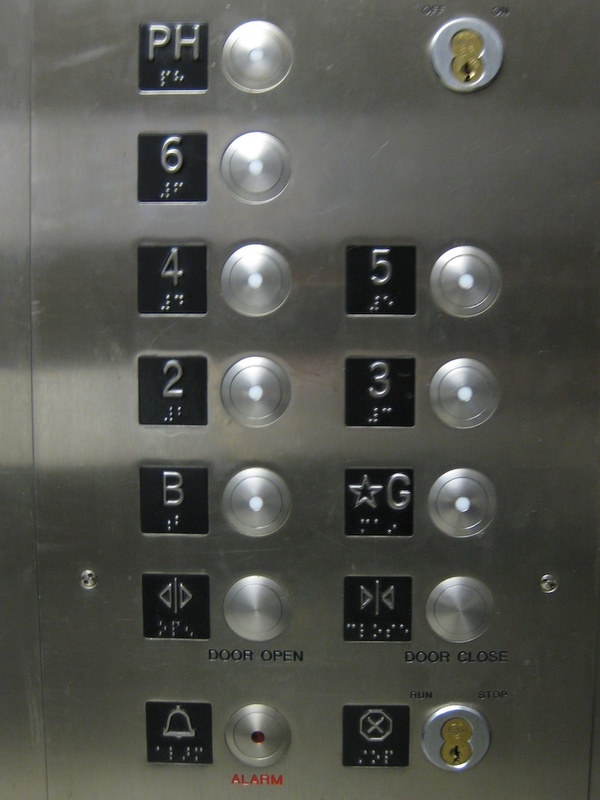 Here's a picture of the elevator buttons showing that at the bottom we have DNA (B for bases), which is followed by G (for genotype or genome). After that comes several levels that are so far unnamed in genetics (here merely labeled 2 through 6), and then finally we have, of course, PH standing for the phenotype, meaning the total sum (or product) of all the physical characteristics of the organism. I am rather certain that the architects had a specific hypothesis in mind when they chose to make the building have a total of eight floors, with five of them in between the genotype and the phenotype. Michigan State University is, btw, a fantastic place to be for an evolutionary biologist. We have a rich influx of researchers in evolution speaking at various seminar series. MMG, for example, has a seminar series (schedule) which includes Antonio Lazcano speaking next Tuesday about "Evolution, creationism and intelligent design: Mexico's love affair with Darwinism". The Ecology, Evolutionary Biology, and Behavior program's seminar series (schedule) today features John H. Werren speaking about "Heritable Microorganisms & Evolution", and on April 28th Dolph Schluter is the EEBB Distinguish Speaker with a talk on "Natural Selection and the Genetics of Adaptation in Stickleback". The EEBB Colloquium series (schedule) includes students and postdocs talking about their research, including a great talk yesterday by Raffica La Rosa on “Adaptation in milkweeds: selection through both male and female fitness”. Additionally, MSU is the headquarter of BEACON Center for the Study of Evolution in Action, which hosts a meeting every Friday with talks by members of the five partner universities: Michigan State University, North Carolina A&T State University, University of Idaho, University of Texas at Austin, and University of Washington (no schedule online, but always guaranteed to be interesting). But most of all is the many great people who work at MSU, including professors, postdocs and students. Two doors down from me is Rich Lenski of the famous Long-Term Evolution Experiment, and lots of other fantastic research is being done here (e.g., take a look at this media coverage page). I love it here. Weather could be better, but the academics couldn't. I see. The big shots really do have a busy schedule, don't they?